Nearly one in five people diagnosed with cancer is waiting more than two months for treatment, figures show. NHS Scotland statistics revealed that 82.7% of patients received treatment within the 62-day target between October and December 2018. Just one Scottish health board - NHS Lanarkshire - hit the Scottish government's 95% target. The percentage of patients treated in the 62 days after referral was down 4.4% on the final quarter of 2017. However, the total number of patients with cancer referred in that period rose by 398 to 3,791, an 11.7% increase. Waiting times for cervical cancer treatment rose in the latest figures, with only 53.7% treated within two months, compared to 89.7% between July and September 2018. NHS Scotland narrowly missed the 95% target for people starting cancer treatment within 31 days after a decision about the treatment is made, dropping from 95.2% to 94.9% in the last quarter of 2018. Health Secretary Jeane Freeman said: "Once a decision to treat has been reached, patients in Scotland wait on average five days for treatment - a reduction from six days in the previous quarter for the 31-day standard. "However, these figures show that some patients are waiting too long from urgent referral to treatment. "I have been clear with health boards that cancer patients must continue to be prioritised." Ms Freeman added: "The most urgent patients, including those suspected with cancer, will be prioritised and seen between two to three weeks." 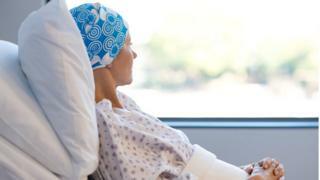 Gregor McNie, Cancer Research UK's head of external affairs in Scotland, said the figures showed "a service under huge strain with too many patients waiting too long". He added: "Early diagnosis and prompt treatment delivers much better results for patients and yet cancer waiting time targets in Scotland are routinely missed. "If the NHS is to meet increasing demand, as well as diagnose as many patients as early as possible, the Scottish government must plan to meet current and future need." The party's health spokeswoman, Monica Lennon, said: "Scottish Labour has long supported a two-week waiting time for cancer diagnosis to raise survival rates. "The health secretary must set out in detail how she will urgently increase capacity in cancer detection and treatment to deliver the care that people need." Miles Briggs, health spokesman for the Scottish Conservatives, said the figures "clearly show that patients needing cancer treatment are waiting increasingly longer to be seen". He added: "Jeane Freeman continually refers to her Waiting Times Improvement Plan, but this isn't much good for the people who are waiting too long now for potentially lifesaving treatment. "The Scottish Conservatives have pledged to introduce a fast-track diagnostic service for cancer patients in order to significantly improve cancer waiting times in Scotland." Meanwhile, the number of people waiting six weeks or more to start their first treatment for drug or alcohol issues has risen by about 5%. By 31 December last year, a total of 2,547 people were waiting to start treatment. Of these, 364 (14.3%) had been waiting more than six weeks - double the target. This was up from 236 (9.4%) at the same time the previous year. A total of 10,550 people began treatment between October and December 2018 and 93.9% were seen in three weeks or less - meeting the Scottish government's 90% target.